This jacket is all about the little details, so I'm starting by making the epaulettes and all the pockets and their flaps. I enjoy this kind of a challenge but it's very time consuming. 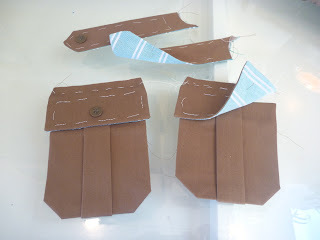 I lined the upper flaps and epaulettes with scraps of oxford cloth from my Spring buttondown. Here's a closer shot. It's my take on the spring Comme de Garcons look. 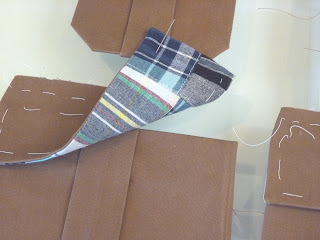 As it turned out I was extremely tight on the brown fabric, and this saved me from having to struggle with every little scrap. 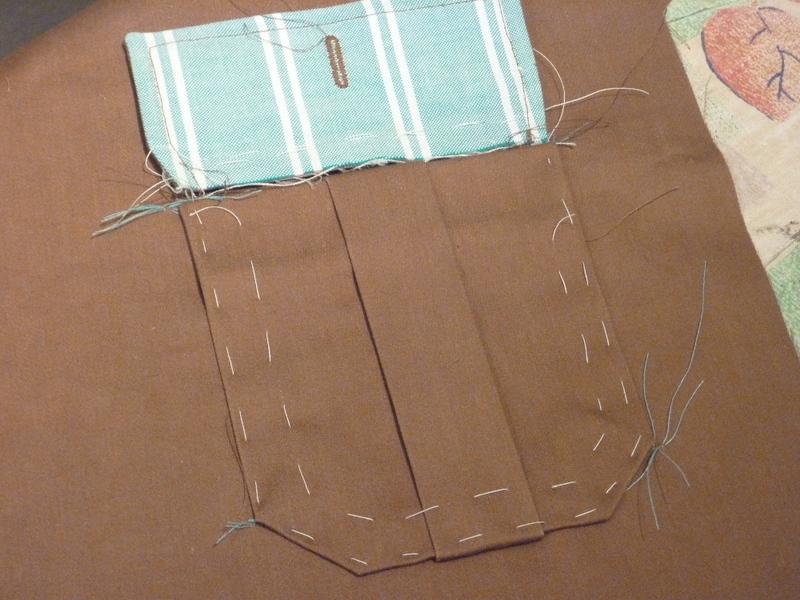 The pattern calls for rectangular pockets but I opted to "clip" the corners off. I think it's a more interesting, more authentic safari look. I made a cardboard template for the corners and pressed the fabric back over the cardboard. This helps keep the pockets consistent. 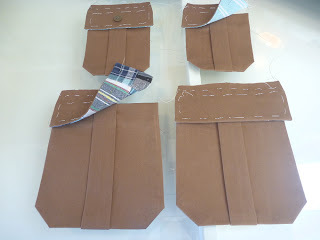 The lower pocket flaps are lined with a patchwork madras. I'm planning to use this as the contrasting undercollar and also at the back vent. Now it's time to baste the pockets and flaps to the fronts. 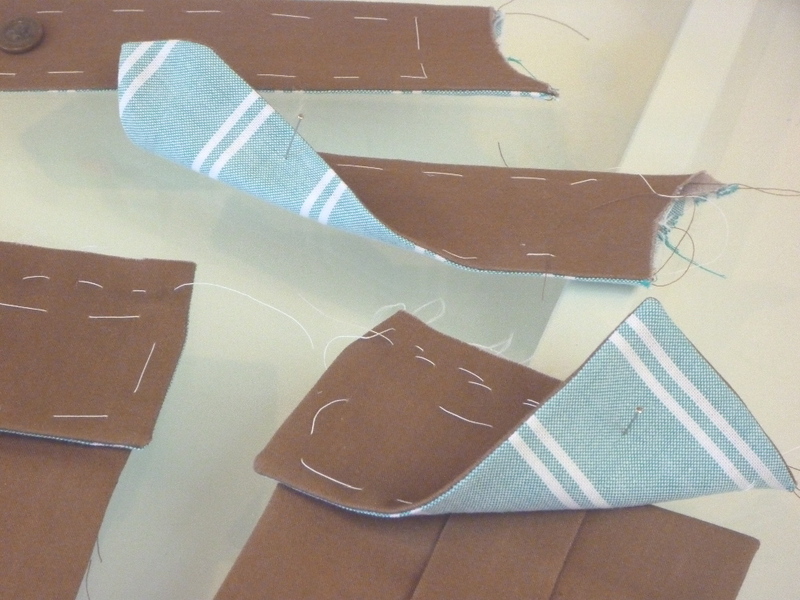 Then they will be topstitched in place. But that's another whole day's work. Your patience with working out all of the details whether it be pocket corners or sleeve seams meeting body seams will be rewarded.You obviously have the knack for solving problems and have lots of vision!Looking forward to seeing the final jacket. Pockets and flaps and pleats just take up so much time but make such a dramatic difference! Love to see your progress!